What follows are two interviews in one. The first half contains excerpts from a conversation I had with Viktor Troicki at the 2012 Cincinnati Masters. The second half is a recent interview conducted by Nebojša Mandrapa, the tennis reporter for Serbian newspaper Večernje Novosti, who has kindly permitted me to post a translation. Troicki, considered a hero of Serbian tennis ever since he scored the clinching point in Serbia’s Davis Cup victory over France in 2010, was suspended from professional activity last July. (Those needing a refresher on his case, which led to his being sanctioned for violating the ITF’s anti-doping rules, can read my overview and other players’ reactions here.) He’ll return to action in just over a week, in all likelihood playing on the Gstaad clay for the first time in his career. As fans of men’s tennis will recall, Troicki rode the wave of his team’s triumph all the way to a career-high ATP ranking of #12 in June 2011. Although he broke into the top 100 as a 22-year-old in 2008, and finished both 2009 and ‘10 within the top 30, it wasn’t until his first singles title in October 2010 and the Davis Cup win six weeks later that Troicki’s career really took off. In fact, many in Serbian tennis circles were surprised at just how fast and how high he rose, given that he had long played second fiddle to not only Novak Djoković but also Janko Tipsarević, who was a more talented junior player. Although Troicki’s time among the men’s tennis elite—thirty-four weeks in the top 20—was relatively brief compared to the elder Tipsy’s, it was Viktor who made more efficient progress up the ranks as a young pro and he who earned an individual title first. © Getty Images Viktor Troicki dismissed Lleyton Hewitt for the loss of two games. When we sat down in what is technically Mason, Ohio, Troicki was feeling good after demolishing former #1 Lleyton Hewitt in straight sets. Knocking off top players wasn’t a new experience for Viktor (for instance, he beat Andy Roddick in the Washington quarterfinals back in 2008, when the American was #9), but he’d been having a difficult year. Though his recent struggles became our focus fairly quickly (even before I’d asked about them), we began by looking back to 2010. AM: Can you compare winning the Davis Cup with winning your first ATP title about a month earlier? Together, they mark a key turning point in your career. (Troicki was ranked #54 before a semifinal run in Tokyo, #43 before the Kremlin Cup in mid-October, and #30 at the end of the regular season.) So, do you think of them together, as a sort of unit, or separately? VT: Yes, definitely different things—totally different things. It also felt different. Of course, my first title gave me a lot of confidence. I played great that week in Moscow, beat some big names, and I think I played my best tennis at the end of that year. Then, the Davis Cup finals came and, for sure, knowing that I had a title already and that I was playing very well, I was more confident than usual. I think that’s why I played very well in Davis Cup also. 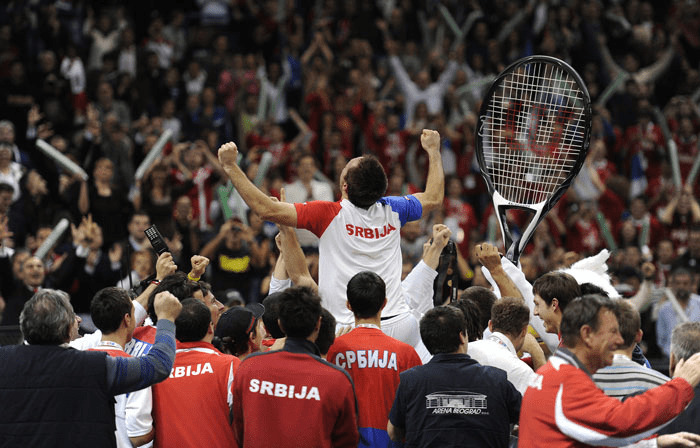 Winning Davis Cup was the biggest moment of my life—it was just a great experience. It felt unbelievable on the court, winning that last [rubber]. I just hope it happens again. * I mean, it’s the moment I’ll remember for the rest of my life—just an unbelievable experience. VT: Well, I started 2011 great, continuing to play very well. I came to #12 in the world playing really good tennis. And then I had some matches where I. . . (sigh) had the chance to win, where I was very close to winning, for example against Murray at the French—I had a chance to go to the quarters, I was serving for it—and also in Montreal against Monfils, I had match points which I didn’t use. So, all these. . . those two matches, like, [set] me back. I lost a bit of confidence and then I started to play less [well] than I was playing before; my ranking was dropping and I was losing some matches that I shouldn’t lose and I was unhappy. . . I would say 2011 was a year with ups and downs. Luckily, I hope, that’s over and I think I’m going to rise again in the rankings and get back to the top 20 and then, hopefully, go for the top 10. AM: You talked about the effect of those two losses on your confidence, but is there anything else you want to add about why it’s been hard to maintain a high level consistently. I mean. . . people are going to say that you’re in a slump, right? But I don’t know if you think of it that way or not. When I look at your playing activity, there are actually only a few losses that jump out at me as unexpected—like Bucharest. Something like losses to Rosol no longer look weird after what he did at Wimbledon. VT: It happens to every athlete—it happens that he has good days and bad days. (Sigh.) We all have ups and downs. I guess it’s normal for every tennis player also. I mean, the thing is to get out of it as quickly as you can, try not to think about it, and try to improve from those things—what you did wrong. So, I hope I’ve learned some things from those matches. I work hard every day to improve my game, so I hope these things won’t happen again. AM: How much do you work on mental aspects of the game—not so much strategies or tactics, but things like positive thinking? VT: Yeah, I had a person this year, during the tournaments in Europe, who I was talking to. We were doing some sessions—mental sessions, psychological treatments. He helped me a lot, I think. We did a good job and I still use those things. AM: Did you guys actually identify, say, types of negative thinking? VT: We talked about not just tennis, but how to make life a nice place—to enjoy life, to be happy on the court. Sometimes when I was on the court and I was losing, I was really not happy. When it was not going my way, I was pretty unhappy—those were the things that were maybe not helping me. So, we tried to improve that and to start thinking positive on the court, even if it’s not going well. Hopefully, I’ll still improve on that point. AM: What do you consider your best or most satisfying performance of the year? Dusseldorf strikes me, since it was several wins in a row. . .
VT: Well, I played Wimbledon fourth round, which was my best Wimbledon so far. I reached the fourth round (lost to Novak), which was a good result for me. Beating Juan Monaco, I also played a good match there. Maybe [today] was the best win, against Hewitt: to beat him 6-2, 6-0 was pretty surprising, even for me, and I think I played very well. But my best tournament, I would say, was Wimbledon. AM: You won a couple five-set matches in a row—arguably, it’s especially important to get through those. VT: Definitely, definitely. Actually, I made a record in Grand Slams for most consecutive five-setters. So, it’s definitely a good thing when you’re winning those important matches, when it’s really tight—it means a lot and gets your confidence back. It wasn’t only Troicki who suffered through those ties, however. Due to his and the injured Tipsarević’s absences, Team Serbia was significantly undermanned when they faced Czech Republic in the final. Speaking with Mandrapa in Belgrade last week, Troicki was both bursting with motivation to return to the top ranks of the ATP and anticipating mixed emotions when he steps on court at his comeback tournament. Q: What will you be feeling when you return to action? VT: From the wish to show that they were wrong to suspend me, to the hope of proving to myself that I can do even better than before— above all, a desire to make up for lost time… All of these emotions and much more will be present. To be honest, I don’t know myself how it’ll be on court in the beginning, until I get used to it. At the same time, all my points will be gone by July 21 and I’ll be starting from scratch, completely from scratch. However, I often remember a very good saying, “Once a doctor, always a doctor.” That’s why I haven’t given up on tennis: because it’s who I am. Q: This period, from July 2013 until today, did it feel like an eternity? VT: Too long, I’d say. It was hard for me without tournaments, very hard. But, I have to admit, some moments were nice and interesting, too. I had time for everything. Now, I’m completely recovered mentally, and not so nervous and burdened with all of this like at the beginning. When [the CAS tribunal] made their decision to uphold my suspension, it was a huge shock. But since then, I thought about it all in peace—about the future, not so much about everything that happened. Q: Have you had any psychological help to overcome all these difficulties? VT: I tried, but I didn’t like it too much. I realized that it was all up to me. If I sort out the dice in my head, then that’s that—and I don’t need someone else’s help. If I manage to straighten myself out, that’s enough. Q: You mentioned that the year was, at times, interesting. What did you have in mind? VT: I went skiing four times last winter—more days skiing than ever before in my life. I wanted to catch up on things I love and haven’t had much chance to do. Often, I’d play football with the guys—we had an indoor league. And I went on a couple of trips with Nole, including my first time in South America, which was interesting. Then, when I started to train, I also accompanied Djoković to a few tournaments he played, so I’ve practiced with him a lot. Q: Was it difficult for you to find sparring partners, players with whom to practice? April: Viktor trains with Dutzee & Nole in Monte Carlo. A: Exactly; that’s exactly right. But Novak helped me there, too. Mostly, I worked with him—in Monte Carlo, or during tournaments in Dubai and Miami. I also sparred with our younger players: Lajović, Krajinović, Milojević in Belgrade. Q: What were you working on, looking to improve? VT: For the last four months, I’ve really practiced a lot. Luckily, both members of my team—coach [Jack] Reader and [fitness trainer/ physiotherapist Miloš] Jelisavčić—are still with me. In some areas, I feel progress, but I’m lacking competitive play: points and other match situations. That’ll come eventually, after a couple of tournaments. I can’t claim that it’ll all be in place by the first tournament (at that point, everything will probably still be totally strange), but I hope it’ll be sorted out as soon as possible. Q: Due to the loss of ranking points, you won’t have direct entry to the biggest tournaments at first? VT: Some tournament organizers have kindly offered me a wild card. I won’t play at the major events. Right now, we’re waiting for confirmation from Gstaad, and I’ll definitely participate in the Italian Challengers, four or five tournaments which coincide with the US hard-court season. Novak will try to help me with securing wild cards for the Asian swing. If he succeeds, that would be great. 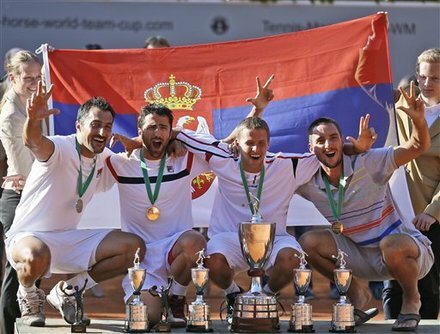 Q: Serbia’s Davis Cup team heads to India in mid-September for a World Group playoff. Will it be with or without you? VT: I honestly don’t know what to say. It doesn’t fit into my schedule at all. At that point in the season, I plan to play on clay, and I don’t feel like going to India. I’d be losing two weeks, not just one; I can’t play on the main tour if I don’t get wild cards and, just then, I’m planning to play some bigger tournaments. I hope the younger players will help and that they’ll be able to win the tie. We’ll see who’ll even be in a position to play. Maybe Tipsarević will manage to recover by then, but I think we’re the favorites no matter who plays. In a New Year’s statement, however, Viktor had a slightly different perspective on whether a return to the tour or the opportunity to rejoin the Davis Cup team is more important to his comeback. Q: Are you fulfilled on a personal level—because that can have an impact on your results? VT: Everything’s in the best possible order. My mother and father have been the biggest support my whole life. They always believed in me. There were also a few other people, like Neša Trifunović, who’ve been a lot of help. From them, I got valuable advice. They told me that a year is short period in life and that it’ll pass—that I have to survive mentally, to be even stronger and even better. I appreciate that. My parents are very excited that I’m returning to the court, although I won’t see them as much as in the past year. Q: Do you believe you can do better than the #12 spot you once occupied? VT: I don’t know, but I’ll try to prove I can. We’ll see how well I’ll succeed in that. Certainly, I’ll give my best—more than I gave before. My goal is to fight to the last point, and to get into the top 100 by the end of 2014. It won’t be easy; but if I start well, I think I have a chance. In the end, it’s all up to me. This entry was posted in tennis and tagged ATP, Davis Cup, ITF, Serbia, Viktor Troicki by amitric. Bookmark the permalink.